BECAUSE I always finish my Christmas shopping way ahead of December, I sometimes miss out on the latest cute stuff in the department stores. 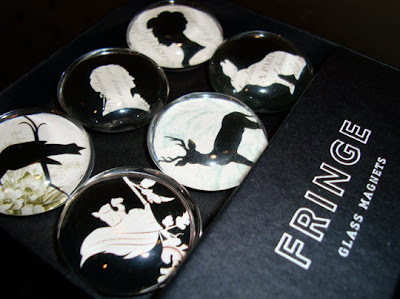 I was at Rustans ATC a couple of days before Christmas as my sister had to make an emergency purchase for a can opener (don't ask, it's a long story), and stumbled on these gorgeous Fringe refrigerator magnets. These babies don't come cheap, but I just couldn't resist them. So after a few days of tossing and turning in bed, I finally went to get myself a set (first photo). Okay, there goes my last frivolous purchase of the year. hehe. Oh, and these are versatile as well. You don't have to use them only as ref magnets. As one contributor to Apartment Therapy shared, her household actually uses the magnets as small paperweights. Coolness.